Approx. 75 beads on this 8 inch strand of 2.5mm Chrysoprase faceted gemstone beads. These would be great beads as spacers or even try them in your bead weaving projects, substituting these beads for a round 2 to 2.5mm bead! 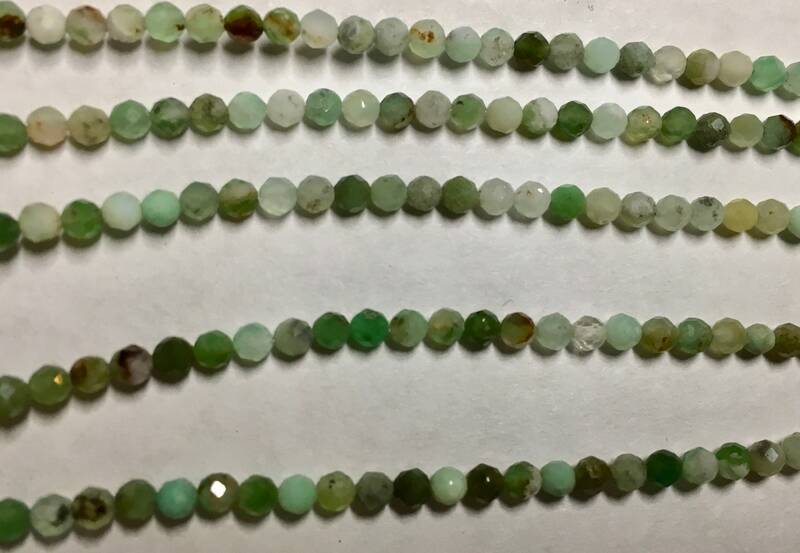 Chrysoprase is a gemstone variety of chalcedony (a cryptocrystalline form of silica) that contains small quantities of nickel. Its color is normally apple-green, but varies to deep green. Chrysoprase has metaphysical properties for healing as well as being a stone to attract new love, abundance and prosperity. It promotes joy and happiness and brings through the vibration of Divine Truth, while helping to heal the heart of the energy of depression and anxiety. Note: All semi-precious beads are natural stones and will vary in size and color from strand to strand.